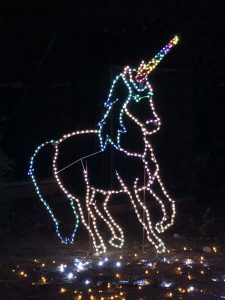 I always look forward to going to the zoo and seeing millions of glowing lights during the holidays. Zoo Lights is one of my favorite traditions. 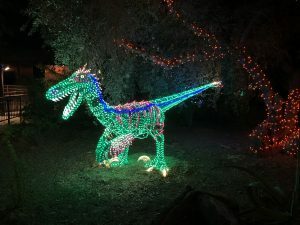 Phoenix Zoo’s Let it Glow is at it’s very best this year! As an adult, it’s tough to have a holiday experience that truly makes you feel like a kid again. At the zoo, I found myself dancing along with the music-themed light show. I took silly photos and did not care what strangers thought. I found myself truly in the moment staring at the details of the lighted displays. That’s exactly why I like this event for the whole family. Everyone in your crew is going to feel entertained. The little ones will be mesmerized by the three-story lighted tree and the chance to meet Santa! Teens will love taking selfies and Snapchatting the whole experience. The whole family will genuinely enjoy the musical light show. Plus, you get to experience a nightly snowfall at 7:30pm. Let’s be honest, every Arizonan at any age is ecstatic of snow! Fun fact: Phoenix Zoo created and were the first to use net lighting on plants! Zoo lights is a great spot for date night and since you’re leaving the kids at home go ahead and grab a beer or glass of wine. YES, the zoo serves beer and wine! The most convenient spot I found to grab a drink it the concession stand just west of the carousel at the base of The Neely Center. If this appeals to you, you’ll be eager to learn more about Roars & Pours happening in March. I’ll keep you posted on that. I highly recommend paying a few bucks more and upgrading your tickets to include the Dinosaurs in the Desert experience. This is a self-guided adventure through incredibly lifelike animatronic dinos! I’m not really a huge dinosaur person, but I love science and this exhibit taught me facts about our planet/ animals I did not know. Seriously, I’m still thinking about the fact dinosaurs had feathers and that their was a dino with a 30+ foot wingspan flying over the Southwest once! Little kids were squealing in amazement all around me and I chatted with a grandpa who couldn’t believe how real the dinos looked… so there ya go, entertainment for anyone of any age. I think this experience is worth every penny because there are so many forms of entertainment packed into the experience. However, you know I found you some ways to save! There are value nights or you can even find tickets on Groupon! 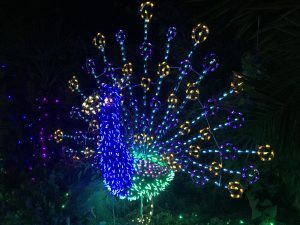 Parking is FREE and you can experience zoo lights until January 14th! Have fun!